Reflecting the area's strong strong Scottish tradition, a 60 foot high display outside of the cruise ship terminal in Sydney is named in Gaelic "FIDHEAL MHOR A’ CEILIDH" (the Big Fiddle of the Ceilidh). 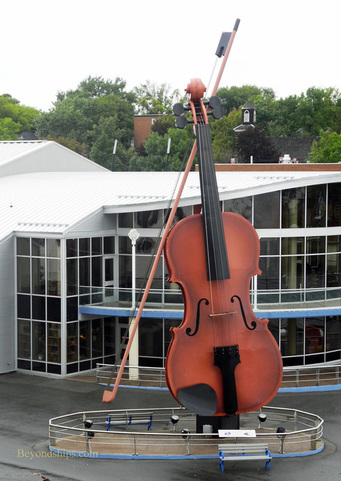 It is the world's largest fiddle. 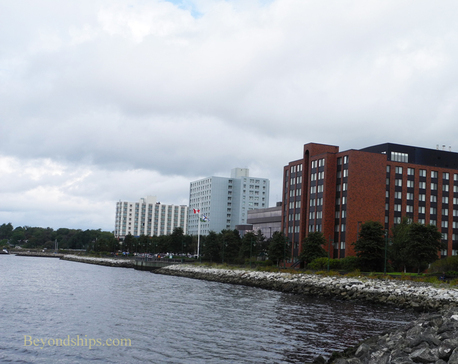 Sydney is the second largest city in Nova Scotia and the largest city on Cape Breton Island. However, with a population of only 30,000, it is more like a large town than a metropolis. Most visitors do not come to Sydney to see the city itself. 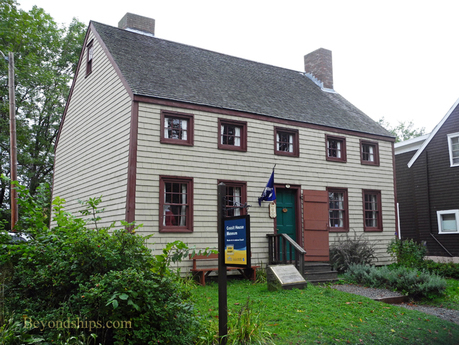 The Historic North End contains several properties of historic importance but you can experience the entire area in a few hours. The rest of Sydney is a contemporary 21st century town. The reason that cruise ships stop in Sydney is that it is a convenient jumping off point for exploring the attractions of scenic Cape Breton Island. Sydney has a fine natural harbor and is conveniently located for tours to other parts of the island. One of the most popular attractions of Cape Breton Island outside of Sydney is the Fortress of Louisbourg, the largest historic restoration in North America. (See article). 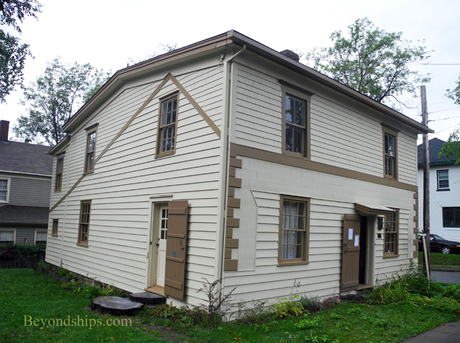 Another popular attraction is the Alexander Graham Bell National Historic Site. Although remembered as the inventor of the telephone, Bell had wide ranging interests that involved him in such things as medicine and boat design (he invented the forerunner of the hydrofoil). He spent his summers in the picturesque village of Baddeck and where is now a museum telling the story of Bell's life and displaying many of his inventions. 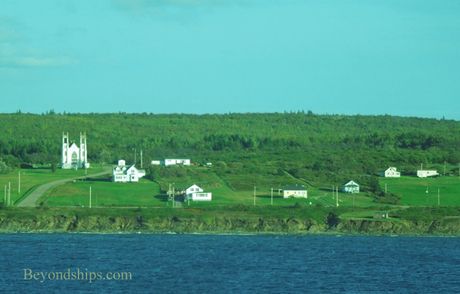 Also in the Baddeck area is the Highland Village. This is a re-creation of a traditional Cape Breton village and shows the influence of Gaelic and Celtic culture on the island. In addition, the 40 acre site has panoramic views of the Bras d’Or Lakes. 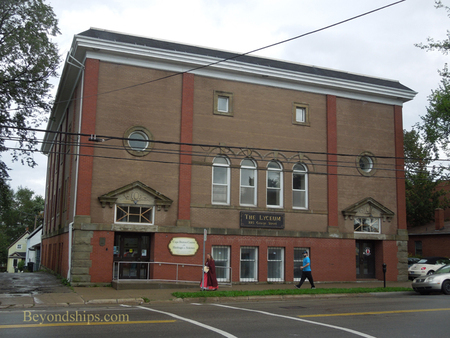 The Underground Breton Miners Museum in Glace Bay tells the story of the days when the island's economy centered on coal mining. You can even descend down into a former coal mine. A more scenic attraction is Cape Breton Highlands National Park. The main highway through the Park is the Cabot Trail, which is known for its spectacular scenery. Completed in 1932, the 187 mile long highway loops through Cape Breton. Above: Sydney's taller buildings are along the waterfront. Above: This Sydney has an opera house too - - the Lycem. Below: The countryside outside of Sydney is rural and picturesque. Above: Saint Patrick's Church can be seen from the cruise ship terminal and is often the starting point for walking tours of Sydney's Historic North End. 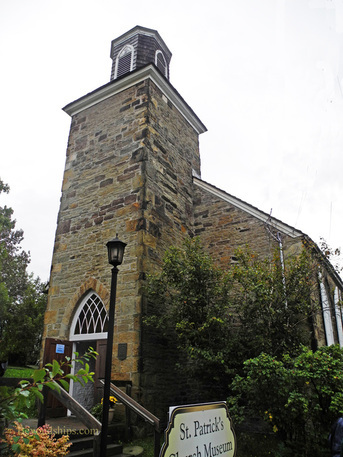 It was built in 1838 and is the oldest surviving Roman Catholic church on Cape Breton Island. There is a museum on the grounds. Above: Jost House dates from 1786. It was purchased by a successful merchant Thomas Jost in 1836 and remained in the family until 1971. Today, its rooms depict various aspects of Victorian life in Sydney. Cossit House (above) is one of the oldest surviving houses on Cape Breton Island. Its original owner, Reverend Rana Cossit was the region's first Anglican minister. Interpreters dressed in period garb show you what life was like in the late 1700s. Left: A statue just outside of the cruise terminal "A land of our own" depicts early settlers. 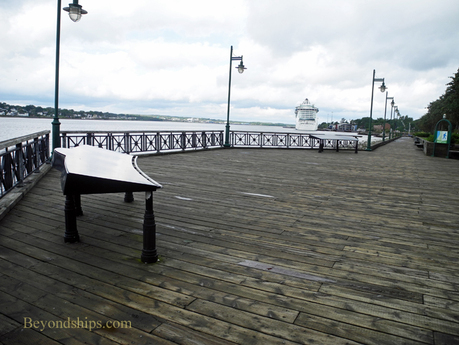 Below: Bordering the water is a boardwalk with benches, viewing points and plaques explaining the history of Sydney. 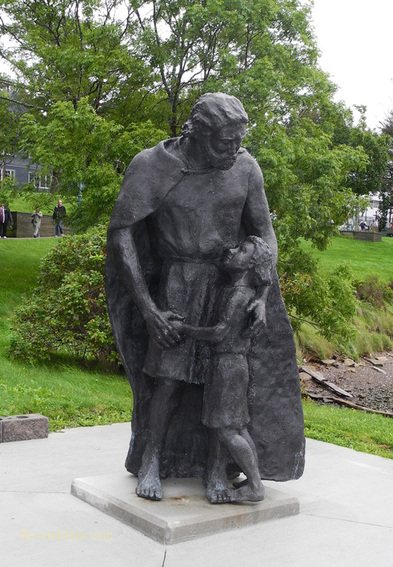 Explorer John Cabot (real name: Giovani Caboto) is credited with being the first European to discover Cape Breton Island in 1497. Although he claimed the island for England, the first Europeans to settle on Cape Breton were the French in the early 1700s. As a result of the wars that took place between France and Great Britain in the 18th century, the French were evicted and by 1760, the island was under British control. Sydney was founded by the British in 1785. The British Home Secretary Thomas Townsend, 1st Viscount Sydney, had named Colonel Joseph DesBarres governor of the new colony of Cape Breton Island and DesBarres returned the favor by naming the capital of the colony after his patron. (A few years later, a town in Australia was named after the same Lord Sydney). The first settlers were a combination of poor Englishmen, former soldiers and a group of Loyalists who had fled New York to escape the American Revolution. Subsequently, immigrants from Scotland came to the area. The Scots had a lasting influence on local culture that remains evident even today. In 1820, the Cape Breton colony was merged with neighboring Nova Scotia. While Sydney was no longer a capital, it remained the administrative center for Cape Breton Island. During the 19th century, coal mining became an important part of the economy of Cape Breton Island. This was augmented by a large steel mill that was built in Sydney in 1901 to further exploit the abundance of coal nearby. As a result, there was an economic boom in Sydney and people came from many countries to settle in the area. Cape Breton is known for its multi-culturalism. Sydney played an important role in World War II. Its steel mill produced much needed steel products for the Allies. In addition, its large harbor was used as a staging point for convoys bringing food and supplies to the Allies in Europe. Following the war, the economic fortunes of Sydney began to decline. The mines and the steel mill faltered in the 1960s. Some mines closed and some were taken over by the government. The decline continued and by 2001, all were gone. As a result, Sydney and Cape Breton have had to shift the focus of their economy. To a large extent, tourism has become the major industry.